Special Containment Procedures: Due to its position and properties, SCP-2460 is not contained at this time. Space agencies are to be informed of SCP-2460's trajectory so that satellites and launches do not collide with SCP-2460. When doing so, SCP-2460 is to be listed as a large piece of space debris. No object is allowed within 50 km of SCP-2460. Any matter colliding with SCP-2460 must be reported to the astronomical tracking unit at Site-195 immediately. In the event of a collision, the mass, density, and Schwarzschild radius of SCP-2460 must be remeasured and its resulting new orbital trajectory calculated. Description: SCP-2460 is a gravitational anomaly in elliptical orbit around the Earth. It has an orbital period of 4 hours, with a furthest distance from the surface of the Earth of 12,430 km and a closest approach of 395 km. Measurement of the gravitational anomaly indicates it has a mass of 1.24 x 1013 kg. At the location of the anomaly, there is an apparent object of approximately 50m x 30m x 15m. This gives the object a measured density of 5.51 x 108 kg/m3, which is approximately 100,000 times the density of the Earth and close to the density of a white dwarf star. The shape of this object is variable in appearance, with components of different materials appearing to erupt from the surface of the object only to be reabsorbed. Furthermore, the object is virtually invisible to electromagnetic radiation and has no measurable charge, magnetic moment, or wave emissions. However, despite this behavior, photons in the visible light spectrum still interact with the object, albeit at a low albedo of 0.01. The anomaly behaves very differently on the quantum level. SCP-2460 is comprised of bosonic matter that anomalously maintains much of the structure of fermionic (normal) matter. This anomalous construction causes the Pauli Exclusion Principle not to apply, allowing matter to occupy the same quantum state as other similarly composed bosonic matter. In addition, electromagnetic interaction is suppressed. As a result, the bosonic electron fields between objects in SCP-2460 do not repel each other. The net result of these anomalous quantum effects is that multiple individual objects within SCP-2460 occupy the same place at the same time. What appears to be objects growing out of and receding into SCP-2460 is actually thousands of colocating objects oscillating about the gravitational center of the anomaly. The exceptionally high mass of SCP-2460 is the result of these thousands of individual objects occupying the same location, all gravitationally bound together. It is important to note that this colocation is not a spatiotemporal distortion, but the net result of the lack of interaction between individual objects in the anomaly. There is no risk of a "reversion" to a Euclidean space, because the space is already Euclidean. A planetesimal with the above dimensions of 50m x 30m x 15m. This item acts as the "surface" of SCP-2460. Of note is the distinct lack of cratering on the surface. A comet nucleus of approximately 5m diameter. Visible spectral analysis suggests that the object's original location was the Oort cloud. A spacefaring vessel of unknown make, 10m in length. The hull is covered with unidentified symbols. Through a plate glass window, two beings are visible, apparently long deceased and dessicated, resembling crocodilian humanoids. Approximately 1,000 metric tons of hydrogen and helium, compressed under gravitation into a superfluid state. Ninety capsules, each containing a single humanoid occupant, each colocating independently from the others. The occupants are apparently dead and dessicated. Addendum 2460-A: On 2/15/2013, a stray orbiting steel bolt attached to a retaining plate from the [REDACTED] disaster was seen to be captured by the gravity well and collide with SCP-2460. It was observed that the collision caused no impact site and the bolt passed through the matter without hindrance. However, post collision the bolt and plate no longer registered any electromagnetic field deformation. Further observation demonstrated that the bolt remains attached to the plate, confirming that the colocation effect of items caught within the anomaly does not extend to items that are exposed within milliseconds to it. This observation further suggests that all objects seen in SCP-2460 were, at one time, normal fermionic matter, transformed by the anomaly into the presently seen amalgamation. It is hypothesized that the anomaly annihilates the quantum spin of the subatomic particles, transforming the matter from fermionic to bosonic and allowing it to colocate. Containment procedures updated to prevent further matter collisions with SCP-2460. Further testing is suggested. Addendum 2460-B: On 2/5/2014, SCP-2460 was noted to pass within 70 km of Foundation Orbital Unit-11, and a sortie was authorized to intercept the anomaly for quantum measurements. Agent Rick Roberts was sent in Probe OU11-3 to examine the anomaly at close range for testing of the quantum signature of the matter within the object. Radio contact with Probe OU11-3 ceased when the probe came within 5 km of the central mass. Approximately 0.5 seconds before loss of contact, apparent density of the low Earth orbit medium seen to increase from 1.0 x 10-11 kg/m3 to 7.3 x 10-9 kg/m3. All remaining data from the experiment comes from the cameras aboard Orbital Unit-11. Agent Roberts quickly noted the lack of radio contact, and engaged thrusters to maneuver away from SCP-2460. The fuel was seen to ignite and pass ineffectually through the hull and cabin of Probe OU11-3. Unable to adjust position or trajectory, Probe OU11-3 was gravitationally captured by SCP-2460 and fell into the central mass. 15,534 kg added to the mass of SCP-2460. Trajectory and Schwarzschild radius recalculated. Containment procedures updated to include a mandatory distance of 50 km. Foreword: Dr. C. Argent presents the results of her observations and experiments with SCP-2460. Dr. C. Argent: Good evening and welcome. I want to thank everyone for coming this evening. Tonight, I am going to explain what, exactly, SCP-2460 is, and the risk it represents for the Earth. I could explain the fermion-to-boson conversion called quantum spin annihilation, explain how this interaction is possible under a version of supersymmetry, the transformation of quarks to squarks and so on. But I'm sure that that would go over most of your heads. You could learn it all, but you're here to understand what this is and what it means. I'll spare you the physics. I'm sure you've heard stories of walking through walls. Ghosts, radio waves, certain anomalies, et cetera. Phasing is a popular term for it. In essence, SCP-2460 is a collection of objects - asteroids, comets, nebula material, stellar mass, and more - all phasing through each other. It's important to recognize that this phasing is the sole reason all these objects exist in the same place at the same time. This is not a spatiotemporal distortion, at least, not anything more than is fully and non-anomalously explainable via its gravity alone. However, what is less explainable is the lack of electromagnetic interaction within SCP-2460. Firstly, this means that there is no radio communication possible with anything within the anomaly. Radio waves pass through it as if it wasn't there. This is also what leads to the phasing effect we see. You know how we are made of atoms, and atoms consist of a nucleus surrounded by an electron cloud? These electron clouds are negatively charged and push each other away, and that's why we can't walk through walls. But within SCP-2460, the electron fields between objects introduced at separate times don't interact, don't push against each other, and as a result, don't stop objects from passing through one another. But wait, you're probably asking, isn't the photon the gauge boson for the electromagnetic interaction? Why do we see anything? Okay, you're likely not asking that, but I did, first thing. The truth is, we don't see most of SCP-2460. Experiment 2460-B proved that. We saw the medium density around Probe OU11-3 increase nearly a thousandfold before losing contact. There is a cloud of massive particles that have nearly no interaction with normal matter extending as far as 5 km from the central mass. There are only two ways these particles interact: gravitationally, and rendering normal matter that comes in contact with it out of phase. These particles are invisible and otherwise undetectable. All remaining mass was added subsequently, acting as an anchor for the particles. That's why we can see the massive objects in the center. What's the risk from this? Well, it is exceptionally dense, and thus perturbations from its present orbit will preferentially cause the orbit to decay, resulting in SCP-2460 falling to the Earth. Now, since it remains "phased out," collision with the Earth won't cause any impact crater. However, the quantum spin annihilation will affect all matter the anomaly passes through, resulting in invisible holes of phased out ground. SCP-2460 will pass unhindered through the center of the Earth, transforming matter the entire way, leaving a giant hole through the center of the Earth that the liquid mantle and core will gush into, the crust and surface eventually falling, unsupported, into the hole. But it won't end there. The momentum in SCP-2460 will propel it all the way back out of the center of the earth, back to the surface, where it will gravitationally oscillate back and forth, back and forth, rendering more and more of the Earth out of phase with itself like Swiss cheese until the entire planet collapses into a central superdense pile of untouchable rubble, constituting a QK-Class Quantum Degeneracy End-Of-The-World scenario. So I'm sure you agree that we want this thing as far away from us as possible. The problem is, we can't touch it. We can't use thrusters to push it away. There's nothing to push against. We can't deflect it with magnetic fields. There's no electromagnetic interaction. We can only use gravity to pull it away. That means that we will need to tow an asteroid of similar mass into Low Earth Orbit to carefully slingshot the anomaly away from us, then destroy the asteroid somehow. An asteroid approximately 22 km in diameter should contain enough mass to eject the anomaly. Recommendations have been submitted to O5 Command. 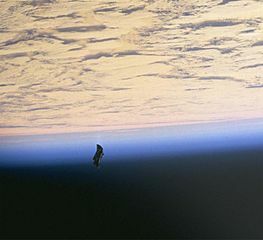 But I'm sure you actually are all asking, what is this, and why did it end up here, orbiting around the Earth? Well, it is an amalgamation of weakly interacting massive particles, invisible to electromagnetic radiation, emitting no radiation of its own, and possessing only gravity. In short, ladies and gentlemen, SCP-2460 is dark matter. And when you consider that fully 85% of the mass in the universe is dark matter, we should not ask why we are so unlucky to have a chunk of it orbiting around the Earth. We should ask why we are so lucky that we haven't hit any of this stuff yet.